Rather stocky, pot-bellied, short-tailed lark; long spiky crest always visible; bill fairly long, slightly curved. Upperparts buffish grey or rusty, rather uniform, diffusely streaked darker on hindneck/upper mantle; breast more heavily streaked. Flight with flapping wing-beats on broad wings showing rusty buff underwings and blackish brown short tail with cinnamon sides. Juvenile heavily pale-spotted above. 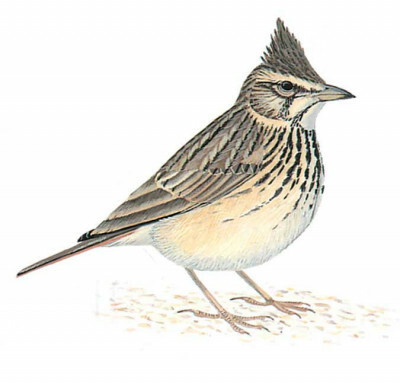 Distinguished from Skylark by shorter, bulkier appearance, spiky crest, longer curved bill, stronger facial marks; also from Skylark by tail pattern and lack of white trailing edge to wing. Sings from exposed perch or high in air.